Sweeping or blowing of fugitive dust during housekeeping is widely discouraged by OSHA and the NFPA for nearly all industries. Seemingly benign, dusts create an assortment of hazards that include flying particles that can lead to eye injury, slip hazards and ergonomic injuries. The most serious hazards surrounding the sweeping and blowing of dust threaten lives, such as respiratory and explosion hazards. The use of vacuums to remove dust is almost always recommended as a preferred method of removing fugitive dust. Rather than redistributing dust, industrial vacuum cleaners remove dusts and therefore reduce or eliminate the previously mentioned hazards. Certainly, the most dramatic hazard associated with dust is secondary explosion. So dramatic that it captured the attention of congress which led to bill that directed OSHA to “issue an interim combustible dust rule and an amendment to the Hazard Communication Standard (HCS) in 90 days, and a final rule in 18 months,” according to OSHA’s Combustible Dust; Advance notice of proposed rulemaking. With over 4,900 violations associated with OSHA’s Combustible Dust National Emphasis Program (NEP), the recent news releases about the organization leveling fines at four companies ranging from $63,000 to $137,000 just this year, and increasing local television coverage of combustible dust violations, it should now be clear that OSHA is serious about enforcing current standards. However, of the over 1000 inspections that OSHA has completed, only 18 to 22 percent of the facilities were in compliance with OSHA requirements. VAC-U-MAX, the leading manufacturer of industrial vacuum cleaning systems for production lines and other dust-intensive areas, developed the first air-operated industrial vacuum cleaner to prevent dust explosions. Although it can be argued that current OSHA standards are ambiguous, hence OSHA’s proposed rulemaking on combustible dust, the standards, however daunting to sift through, are clearly noted in OSHA’s Safety and Health Information Bulletin entitled Combustible Dust in Industry: Preventing and Mitigating the Effects of Fire and Explosions that was first issued 5 years ago. Since OSHA is taking strong enforcement actions to address combustible dust hazards, facilities must make reasonable efforts to mitigate combustible dust hazards. VAC-U-MAX assists companies in understanding OSHA requirements and is dedicated to combustible dust hazards, including OSHA documents referencing the hazards and compliance. According to the Status report, housekeeping ranked second in citations under the NEP “with respect to combustible dust related hazards.” In addition to accumulations of combustible dust being prevalent among the violations, blowing dust with an air compressor, and not using electrical equipment that was designed for hazardous (classified) locations were also among the top violations related to combustible dust related hazards. Further reading of the standard reads “vigorous sweeping or blowing down with steam or compressed air should only take place after the area or equipment has been vacuumed due to the creation of dust clouds by the other methods. With so many standards advocating the use of vacuum cleaners in the housekeeping process, one might be surprised to find so few being used in facilities. Especially since the first air operated industrial vacuum cleaner was developed in 1954 specifically to prevent dust explosions in textile mills. However, when most people think of vacuum cleaners in an industrial setting, they often think of shop-type vacuums that they have in their garages. Sometimes facilities have attempted to employ those types of vacs and find that they not only create sparking hazards, but that are ineffective at sucking up fine dust particles or heavy materials, and often create their own dust clouds when operating. Those shop type vacuums are no comparison to Industrial vacuum cleaners that have 5 times the suction power than commercial or personal use shop-type vacuums. Air powered industrial vacuum cleaners that meet NFPA 77 requirements for grounding and bonding, also meet the definition of an “intrinsically-safe system” because they do not use electricity and do not generate any heat from operation. Implementing industrial vacuum cleaners is one of the most cost effective methods to handle fugitive dust and avoid some of the most cited OSHA violations regarding combustible dust and to protect facilities from catastrophic dust explosions. The three most recent dust explosions this year, two outside the US and one in Douglas County, Oregon that all tolled killed 19 people and injured 53, serve as a reminder that secondary dust explosions are more destructive than primary explosions. The reason for this is increased concentrations of dispersed combustible dust that is activated from the initial explosion. Beyond creating dust clouds that, have the potential to ignite, sweeping or blowing dust during housekeeping routines causes powders to become suspended and settle in hard to reach areas to reach, including beams and walls or areas that are hidden behind equipment or in very small spaces that are difficult to reach during daily housekeeping routines. The accumulation of combustible dust in areas such as this are among some of the most cited violations by OSHA. The use of industrial vacuum cleaners in hazardous location areas, not only removes dust particles as small 1 micron, but when used regularly in housekeeping routines minimizes the amount of dust that can collect in hard to reach areas. Reducing the amount of dust that is suspended in the air leads to lower housekeeping costs because fewer man-hours are required for the task. Reducing the amount of combustible powder that is suspended in the air, by using industrial vacuum cleaners, not only mitigates the possibility for dust explosions, but can also lead to a better respiratory environment for workers, reduce slip hazards and even prevent back injuries caused by cleaning heavy dusts. When dusts hang in the air for longer periods, they can exacerbate respiratory threats. Silica exposure can lead to silicosis, a lung disease caused by continued inhalation of siliceous minerals that are prevalent in glass, brick, cement, asphalt, ceramic, and metal fabrication industries where sand is used as a component or for blasting, as well as in tunneling operations. Fugitive dust and debris is a housekeeping issue that plagues most industries. Working with an Industrial Vacuum Cleaning Manufacturer that is intimate with chemical characteristics produces the best outcome for facilities combating fugitive dust. 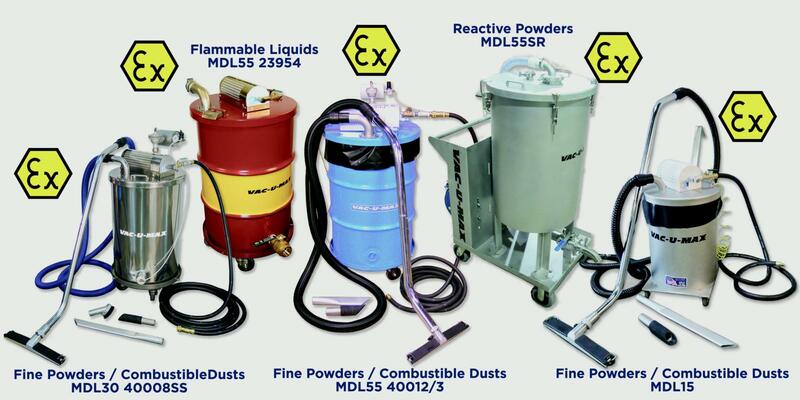 Most Industrial Vacuum Cleaning Solutions that are employed to combat fugitive dust are considered capital expenditures and when working with experts in industrial vacuum cleaning, such as VAC-U-MAX can be purchased as pre-engineered solutions designed for specific powder characteristics. By doing so, facilities can be brought into compliance not only for explosion hazards, but for other dust and debris related housekeeping issues that pose respiratory, slip, and ergonomic hazards. VAC-U-MAX is a premier manufacturer of Industrial Vacuum Cleaning Systems for production lines and other dust-intensive areas. With a VAC-U-MAX heavy-duty industrial vacuum cleaning system on site, both capital equipment and employees are safer and cleaner. To learn more about VAC-U-MAX solutions visit www.vac-u-max.com/vacuum or contact us at (800) VAC-U-MAX (800-822-8629); or email info@vac-u-max.com.